Just like it took most of the almost 2 years of the last Presidential election campaign to drag out of BO just what he stood for & what he was preparing to do to America if elected the details of the Patient Protection and Affordable Care Act incorporating the so-called manager's amendment are also slowly being uncovered. This is the bill that passed the Senate on Christmas Eve. It will be the lead document in the negotiations in the House-Senate conference next week. Thanks to the Congressional Budget Office (CBO) & Rove.com the above table shows in billions of dollars the projected tax increases ($517.7), Medicare Cuts ($475.3), & Spending - for subsidies, etc. ($882) that result in a projected deficit reduction of $111 billion (not counting interest) between 2010 & 2019. CBO & the Joint Committee on Taxation (JCT) estimate that by 2019 the number of nonelderly people who are uninsured would be reduced by about 31 million leaving about 23 million nonelderly residents uninsured (about one-third of whom would be illegal immigrants). Under the above legislation, the share of legal nonelderly residents with insurance coverage would rise from about 83 percent currently to about 94 percent. Approximately 26 million people would purchase their own coverage through the new government insurance exchanges (Plan B toward obtaining the goal of universal coverage) & there would be roughly 15 million more enrollees in Medicaid & CHIP than is projected under current law. 1. Are the reductions in uninsured people summarized above worth the $517.7 billion in increased taxes in a nascent recovering economy? 2. Are the reductions in uninsured people summarized above worth the $475.3 billion in Medicare cuts to doctors, hospitals, & the elderly? For those of us who do not believe that Medicare cuts will take place then throw the $111 billion in deficit reduction out & you can see what will be added to our national debt by the above legislation. On the other hand statistics show that many senior citizens spend an overwhelming majority of their lifetime healthcare expenditures during the last year or less of their lives. Accordingly, denying medical treatment through Medicare cuts to the elderly is one of the best ways to make BO's budget projections be accurate. Choose your poison. 3. The first Medicare cuts go into effect right after the 2010 election - just how dumb are we? 4. Any significant spending on subsidy benefits for the uninsured do not go into effect until the fifth year of the program so there are ten years of revenue collection & only six years of meaningful spending which makes the first ten years of the program look better from a deficit standpoint. If you didn't know the answer it would make you wonder what all of the healthcare reform rush has been about. 5. Look @ the magnitude of the numbers as they increase to the ones shown in 2019 & make you own projections of what happens after that. Parts A & B of Medicare & in particular their respective Hospital Insurance Trust Fund & Supplemental Medical Insurance Trust Fund have been projected for years to be exhausted any where from 2016 to 2019 meaning that the balance in the trust funds will decline to zero. Now we all know that the these trust funds are essentially accounting mechanisms. Any cash generated when there is an excess of receipts over spending is not retained by the trust funds; rather, it is turned over to the Treasury, which provides government bonds to the trust funds in exchange & uses the cash to finance the government's ongoing activities including earmarks like building bridges to nowhere in Alaska. However, these trust funds are not currently running annual surpluses & are therefore just another Ponzi scheme of musical chairs where you don't have to guess who will be standing (out of luck) when the music stops. There are far greater consequences to the world here than just to yourself, your children, & your grandchildren. Below is a Christmas wish I received from Ken Hoagland, Chairman of the FairTax National Campaign. So many people have spontaneously said to me things like "why can't the FairTax be passed because it is so simple & makes so much sense for our country?" Of course you know the answer to that & that is why we have to double our efforts in 2010 because the stakes have never been higher for America's existence as we have known it. The FairTax would pass into law in five minutes if everyone would spread the word the best they can & let their elected reps know their feelings. They came to Bethlehem for the census. They stayed in a manger because no rooms were left. That night changed the world. These thousands of years later, I hope that this holiday season finds you with those you love and reflecting on friendship, grace and the spirit of the season--whatever your beliefs. "With me in my stocking and Ma in her cap, we had just settled in for a long winter's nap...". From "The Night Before Christmas" this will be told again to the delight of millions of children. Honestly, for me that "long winter's nap" sounds just right--even if out of reach with two active boys in the house. Today, we rest and reflect and celebrate. Many will pray. Tomorrow, we think and worry again, as always, about our families, our future and our nation. We are needed by each. As hard as this year has been for our country, and perhaps for you, I sincerely hope that today you find a measure of peace and some rest from your labors. Work on the second American tax revolt begins again soon, so rest well now. We are all needed in the coming year. Merry Christmas, Happy Holidays and the season's best wishes to you and yours. Taking a break from his relentless pursuit of what will surely turn out to be welfare-state healthcare reform if he is successful, BO jetted off to what has been billed "The United Nations' World Summit On Climate Change" in Copenhagen to make a deal where the U.S. contributes to a program where rich nations put up $100 billion per year to help poor nations fight the effects of the political science formerly known as global warming - now known as climate change. Crippling American businesses through the costs of Cap & Trade legislation reductions in carbon dioxide emissions thereby providing one more way of making Americans dependent on government has turned out to be BO's second highest anti-American priority - right after healthcare reform. Next in 2010 will come comprehensive immigration reform where the poorest, most uneducated, & lowest skilled people who stole their way into America in the first place will ensure Democrat reelections & an end to freedoms that all too many Americans have taken for granted. If you think that this Copenhagen conference is really about the environment please watch the video below - the conference provides a forum for the world communist-socialist movement that has the goal of destroying capitalism. Now with all of the billions & trillions of dollars that BO's projects are costing it is no wonder that people have trouble relating to the numbers so I bring Cap & Trade literally closer to home by seeing what happens if you try to sell an energy inefficient house (& they all will be energy inefficient) after Cap & Trade becomes law - please remember it passed the House by of vote of 219 to 212 on June 26. See blog posting dated June 27 for details. In particular Section 202 entitled "Building Retrofit Program" of H.R. 2454: American Clean Energy and Security Act of 2009 (ACES Act) "establishes a program under which the Administrator of EPA, in consultation with the Secretary of Energy, supports development of standards and processes for retrofitting existing residential and nonresidential buildings. Authorizes the Secretary of Energy to provide funding to states to conduct cost-effective building retrofits, using local governments, other agencies or entities to carry out the work, through flexible forms of financial assistance up to 50% of the costs of retrofits, with funding increasing in proportion to efficiency achievement. Also supports retrofits of historic buildings." These rules will obviously affect home sellers, buyers, & builders. In essence when you sell your house, environmental experts have to come in and do a survey to find out if you've got leaky windows, if all the environmental systems are correct, if you have relatively new appliances, and until you modernize in the way they say, you can't sell. The Heritage Foundation has calculated that the cost of this program will be $1870 for a family of four in 2020 rising to $6800 by 2035 - so plot your own cost curve for you & your family from now to $1870 & then to $6800. I suggest doing your own study on this to determine how important stopping the Senate action, when it starts, is to you. Here are some sections of the House bill to use as a starting point. BO tells you how important it is to him in the video below. Below are just three of the responses I received to last night's subject message. The first two are very thoughtful - I love these kind of communications where we can all learn. My comments are in red. Have you calculated what the FairTax will be after all this spending, it will be a tough sell. The progressives have almost implemented their plan in only a few months, nothing will be fair very soon. Your question shows the beauty of the FairTax. With all of this spending we would know what the rate would be & if there is anyone left who cares the bums will be tarred & feathered & run out of the country on a rail. Right now many are tricked into thinking someone else will pay for all of the new spending. Ken points this out in his editorial. I thought some more about your question re the FairTax rate increase following all of BO's spending increases. Please remember that the consumption base in America is twice the size of the income base ($8.8 trillion vs. $4.2 trillion in 2005 respectively) so whatever rate increase is needed for the FairTax to pay for BO's increased spending the rate increase equivalent for combined income tax & payroll tax would be more than twice the FairTax rate increase to generate the same amount of revenue. The FairTax is not the law of the land (yet) so we should be concerned about how much more taxes we will pay under our current system. There are not enough people making over $250,000 per year to pay for all of BO's spending so it will come down to the rest of us as it always does. The FairTax passes the four tests that should be required of any tax - efficient, transparent, uniform, & promotes economic growth. The author of the Houston editorial makes a huge assumption. He assumes that the blood running through the veins of the 300 million Americans occupying this county now is made up of the same determination, fortitude and love of Country of 200 years ago. This Country is not the same. Half the population pays no taxes. The FairTax as I see it is facing a strong head wind. You have to convince the non-payers to pay. Have you seen the faces of America, the faces our soldiers are being killed for, they are in Wal-Mart everyday. - Tremendous point. With re to "half the population pays no taxes" please remember this is true of income taxes but not the regressive Social Security & Medicare taxes that are paid on the first dollar of income. For many people who do pay income taxes these payroll taxes are greater than the income taxes paid. Great editorial by Ken Hoagland! Below is the subject editorial sent to me by Ken Hoagland, Chairman of the FairTax National Campaign. Following the themes of all of the Tea Parties I attended in 2009 Ken presents the FairTax as the solution to America's economic woes. Please note Ken's references to the two party system. At a recent holiday party, the editorial page editor of the Houston Chronicle -- my hometown paper and the nation's fourth largest -- asked me for an update on the FairTax campaign. After filling him in, I promised him a guest editorial defining the FairTax as the solution to the dangerous headlong rush we are taking as a nation toward an "economic cliff." He placed what I sent him very prominently on the front page of the following Sunday's editorial section with a very positive graphic of a man emerging from a torn IRS 1040 form with a bag of money over his shoulder -- and a smile on his face. I thought you would like to see it. It is one more reminder to the public at large that a solution exists -- if we have the will to embrace it. 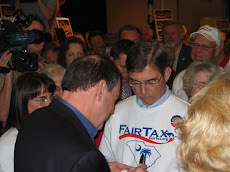 We have big things in mind for 2010 -- which very well could be, "The Year of the FairTax." More than 200 years ago a new idea about the rights of individuals and the rights of government began as a tax protest in Boston Harbor. "No taxation without representation" was the rallying cry that led to the new concept that all government power and authority should derive from the consent of those governed. Is a second American tax revolt now needed to restore that noble but increasingly tattered idea? Somehow, these many years later a new American aristocracy made up of both parties is taxing generations of future citizens, not even yet born, in order to secure mind-numbing levels of national debt today. With government debt now totaling more than $500,000 per household, the voice and best interests of the average American seem lost. We have taken a destructive national path of spending beyond our means that retards job creation, shreds responsible fiscal policy and undermines the pursuit of happiness itself. The second American tax revolt might very well be found in HR25, the long pending FairTax legislation that most in Washington love to hate. The FairTax replaces all federal taxes on income with a simple and transparent tax on personal retail consumption. The FairTax raises the same revenues now raised but in a way that helps the economy rather than hurting it and, most importantly, in a manner that restores the role of the American citizen. Today our federal taxes are hidden from plain view through withheld payroll taxes and by embedding tax costs in the price of American goods and services. The relationship between personal wealth and the cost of government has been effectively hidden, making almost impossible any real check and balance on government spending and self-defeating debt. For candidates from both parties, the promise of new spending buys elections and to many citizens it is "free money" that is being thrown at real problems and needs. The FairTax ends embedded tax costs, puts the cost of the federal government on every receipt and shifts national taxation away from what goes into the economy  work, savings and investment  to what comes out of the economy  consumption. The FairTax expands the tax base so that nearly every American sees a tax reduction. The average tax bill (adding together Social Security/Medicare and income taxes) now amounts to more than 30 percent of what is earned. The FairTax caps taxation at no more than 23 percent of what is spent. In essence, those who spend more pay higher taxes without exceptions granted by Congress to the favored few with tax lobbyists. The FairTax protects the poor and middle class in several ways. First, a monthly "prebate" paid to every family reimburses the FairTax paid on retail spending up to the poverty level, wiping out federal taxes on those at or below the poverty line while also eliminating the highly regressive FICA payroll tax. For a middle class family of four, the prebate allows more than $28,000 of federal tax free spending a year on top of an overall tax reduction. Advanced economic modeling shows that the poor and middle class are the biggest beneficiaries of the FairTax in terms of tax reduction. By eliminating all federal withholding and payroll taxes, the FairTax brings taxation into the open so that average Americans can fairly debate the cost/benefit of devoting personal wealth to so much government spending. It is a desperately needed awareness if we are to control our government. At the same time, shifting away from taxing labor, manufacturing, investment and upward mobility itself will make the United States the most favorable tax environment in the world. This will bring trillions of dollars of private investment, now offshore, into our economy. Without borrowing against the future earnings of our offspring, this private investment creates jobs, better benefits and a new era of economic growth where productive American workers are again in high demand. The FairTax doesn't pit the poor against the rich or Wall Street against Main Street. While every economic level benefits under the FairTax, the poor and middle class see the greatest immediate tax benefits. If there are losers they are congressional committees who can no longer sell pieces of the tax code, illegal immigrants and those in the $1.5 trillion a year underground economy who become taxpayers as consumers and foreign producers who now enjoy a tax advantage over American manufacturers. But because the FairTax ends the $1.5 billion a year tax lobby business along with congressional power over the tax code, it will take another tax revolt to trump the narrow self-interests of Washington insiders. The good and bad news is that a relative few, but politically powerful and influential, Americans profit richly from the corrupted tax system. With all their profits and power, can they be bested by hometown Americans across the political spectrum? Only if we remember that the first American tax revolt earned us that right. 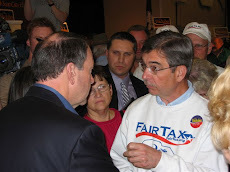 Hoagland is chairman of the FairTax national campaign and a long-time Houston resident. His book, "FairTax Solution," goes on sale in March. With both our many new blog subscribers & e-mail club members in mind I made the following two postings under "Classics:"
Go to ReturnToExcellence.net & click on "Classics" on the left hand side. Also recently posted under "The FairTax" is the piece entitled "A Comparison Of The FairTax Prebate To The Earned Income Tax Credit To A Negative Income Tax To The Flat Tax." The responses to last night's subject message were unanimous - people really do want to get rid of this Congress. Now all we have to do to exercise our term limits right is follow through & keep turning the bums out until we have a Congress full of fiscally prudent Members as graded by the National Taxpayers Union. Spread the word of this plan. Below are three of the responses that provide the flavor of all of the ones received. Dear Jim - Here is a variant of GRIP. I think it deserves an airing on your show. Many of you have seen the piece making the rounds on the internet the past several months that sometimes has the self-explanatory title "Vote The Bums Out." I know this because many of you have sent the piece to me. It is amusing that several in our group like the idea of the piece (i.e. ; voting out all 435 Members of the House plus one third of the Senate in 2010) so much that they claim to have written it themselves or @ least boast that a close relative like "my baby brother" wrote it. Now with Congress regularly polling in the 20% approval range for several years the thought of exercising our term limits right every two years is appealing. The problem is that we do not vote for the lowly rated Congress but rather individual Members whose constituents think are doing a fine job - so most constituents say just throw out the rest of them but leave mine alone. Incumbents get reelected well over 90% of the time - a rate just below Saddam Hussein's. The practical problem in effecting such a plan lies in the details. We have members of our group who are Republicans, Democrats, many with no party affiliation, & one who wishes there were no parties @ all. Lets start with an incumbent Republican & a Republican voter. In order to vote the incumbent out of office the Republican voter will have to vote for someone other than the incumbent in a Primary. If the incumbent wins the Primary the Republican voter will have to vote for a Democrat in order to most effectively vote the incumbent Republican out of office. Of course the same steps apply with an incumbent Democrat & a Democrat voter. This process is not going to be very appealing to either lifelong Republicans or Democrats. Anyone who does follow this process will vote for many people they don't like in order to vote the bums out. A better way is to find & vote for candidates in the primary stage that deserve & have earned your vote for your vision of our country. The great SC senator Jim DeMint has said that he would rather have 30 senators like himself than 70 like Specter. Now with only 30 you will lose every vote that comes to the Senate floor but as things keep getting worse & it becomes obvious who is to blame your 30 will become 31 & grow from there so you eventually have some substance in place. We did not get President Reagan until we went through Carter & Ford (who beat Reagan in 1976). Without them I don't know if we would have gotten Reagan who slowed the Socialist movement by over 20 years - in between we once again had no good candidates who could get elected. In summary, I personally am for the idea of voting the bums out as described above but with the tweaking of voting for incumbents who are graded "A" or "B" by the National Taxpayers Union. This handful of politicians have done nothing wrong fiscally & deserve to have a long look @ their records rather than just throwing them out of office simply because they are incumbents. Just keep voting against any incumbent who does not have a grade of "B" or higher from NTU. It will take a while to get the desired result but the deck is stacked against us anyway for the simple reason that we are outnumbered right now as proven by the 2009 Presidential race. If the statists can keep their ground game organization going wealth creating people will never have another candidate of their choice win an election because the numbers are just not there & in fact get worse every day as more people become dependent on government handouts as we slide to the last stage of "Death Of Democracy." This may seem like a message of despair but as one of my lifelong mentors Professor Milton Friedman said "we have to keep trying because it is just too important not to." Below are three varied responses to the subject message that pertained to unemployment, the Stimulus, & how to unleash the free enterprise capitalistic system to create jobs & wealth. Keep your eyes on BO's "jobs summit" planned for Thursday to see if any of the free enterprise methods detailed in the original message are even discussed - in other words will we have a separation of economics & state or will we have the continuation of a centrally planned (against competition) low growth high unemployment economy? Response # 1 comes from a subscriber to ReturnToExcellence.net & makes an excellent point re sole proprietors or partners in a small business. You don't have to be a reader of these messages very long to notice that the writer of Response # 3 did not make, as it applies to me, careful use of possessive pronouns. I can tell you from our experiences things are not getting any better. Don't forget that when small business owners shutdown their businesses they cannot receive unemployment benefits. Since my company deals directly with small business owners, I can tell you that they are nearly ALL, and I do mean nearly ALL, right on the edge of shutting down. Only pride and the fact that they cannot get unemployment benefits keep them hanging on. Also, for many of them, having their business open or closed doesn't change the property tax equation. Thanks for your continued efforts to keep us all informed. I believe this article represents one of your finest writings. Will our grandchildren know prosperity or poverty? Entrepreneurs do create those jobs, but your Pres. is doing everything he can to discourage them by adding big health care increases and increasing the amount of money entrepreneurs pay in taxes. All your Pres. does is spend money that we do not have on different programs, hoping that they can cure the economy. People who are behind in mortgage payments? - govt will give money to their mortgage firms not to foreclose on their homes. This only prolongs the problem. Next year govt will be on big spending project to create thousands and thousands of jobs. Will it work? ?